The 18 hole De Zalze golf course, designed by Peter Matkovich (also designer of Arabella and Steenberg) is situated within the ‘De Zalze Winelands Golf Estate. Kleine Zalze Lodges are situated adjacent to the first fairway. The course has an excellent mix of parkland holes and places maximum premium on accuracy. It has already hosted a number of championship events and will be the host venue for the 2006 Eisenhower Cup.Guests of Kleine Zalze lodges will receive preferential green fees, clubs and carts are available for hire. Opened in 2001, De Zalze Golf course is an exciting addition to the group of international standard championship golf courses in the Western Cape and is currently ranked in the top 3 courses in the province. Winter (May to September) closed on Mondays. 8 minutes between tee off times. Limited 9 holes play after 4pm, by prior arrangement only. 38 drive on carts available, capacity 2 people. Pre-booking essential. 11 sets of Mizuno golf clubs available for hire, including: 1 ladies and 1 left hand set. Dress code, standard golf attire and smart casual in the clubhouse. Golf lifestyle shop with clothing and accessories. Halfway house, with light lunches and bar, as well as a terrace menu for breakfast. Golf functions by special arrangement. Golf clinics and professional coaching can be arranged. The golf courses of: Erinvale, Stellenbosch, Pearl Valley, Boschemeer, Devon Vale, Somerset West and Strand are all within 30 minutes drive from Kleine Zalze. 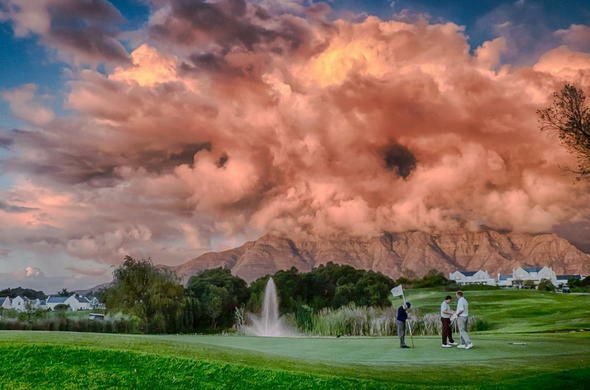 Neighboring Kleine Zalze, Stellenbosch golf course, also designed by Peter Matkovich, offers a parkland setting surrounded by mountains and vineyards and offers a fair challenge with some memorable holes. A championship course, they hosted the SA Open in1999. Set in Paarl, 20 minutes drive from Kleine Zalze; this David Frost signature course is the first 27-hole layout in the Western Cape. The course challenges the low handicaps and scratch golfer, yet not too daunting for the less experienced and offers majestic views of the Paarl/ Franshhoek Mountains. Also 20 minutes from Kleine Zalze in the Paarl/ Franshhoek valley, Pearl Valley is the latest addition to Jack Nicklaus's signature designed courses. The fairly flat and largely uninterrupted terrain enabled Nicklaus to develop a golf course the golfer has to think his way around. 20 minutes drive from Kleine Zalze in Somerset West, Erinvale is a Gary Player designed course. In 1996 it hosted the IGA World Championship cup of golf. With spectacular views of the Helderberg Mountains, the first 9 holes lie in a valley and are quite easy, the second nine however are more challenging, and in parts the fairways ascend quite steeply. A 15 minute drive from Kleine Zalze, Somerset West golf course, while not amongst the top courses in the Western Cape, it is an interesting course, and you have to work quite hard to hit the greens which are not exactly big. 20 minutes from Kleine Zalze, just past Somerset West, Strand golf course is situated very close to the sandy beaches of False Bay. This course is exposed to fresh and strong breezes. It is also known for its water features (no less than 11 in the round). A 15-minute drive from Kleine Zalze, towards the N1, Devonvale is an 18-hole course with spectacular views all the way around and offers the peace and tranquility of the Winelands.